Settled for 13th Istanbul Biennial, Thierry Dreyfus light and video installation, Our dreams remain our dreams will remain until 2016. 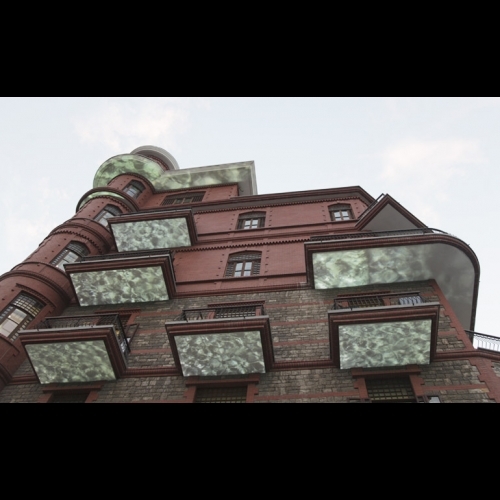 Commissioned by the Borusan Foundation, this work has been created for the BorusanContemporary museum, Thierry Dreyfus’s work is located in the bank of the Bosphorus on an isolated house which seems to be the guard of memory of the strait and of the city. Called Perili Kösk but also the « haunted mansion », this building is one of the most beautiful architectural examples of the Turkish heritage. It was neglected during many years before its restoration and its revival thanks to the Borusan holding. Our dreams remain our dreams. These images will turn the building away from its first likeness, to reveal its dreams and to offer its sincere personality. To leave and run away from the urban stress toward an adjourned time, to loose the gravity, to be sucked up in the dream’s windows or doors opened under the balconies… to see its own dreams and relive buried feelings.